A comprehensive, flexible and inspiring sample library. A score-writer's dream. Quality mic preamps. Rugged construction. Latency-free monitoring. High price point makes this a 'professionals only' purchase. 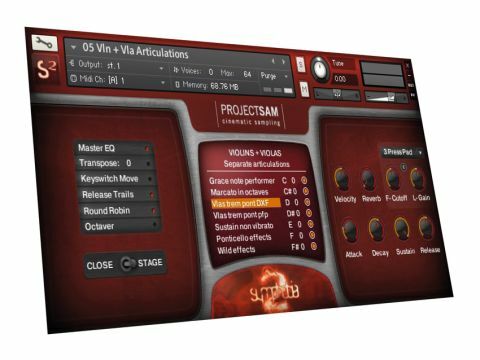 ProjectSam's Symphobia is a Kontakt library of orchestral sounds and textures. In a bid to stand apart from other dedicated libraries in this field, however, its huge success was based on its ready-made approach to providing layers of orchestral patches. Symphobia was a huge hit with those writing music for TV, film and videogame soundtracks. Inevitably though, it couldn't cover all orchestral bases, so Symphobia 2 is here. To avoid any confusion, this is a new and separate library of sounds. As such, there's no upgrade path from the original Symphobia - it's a brand new library, albeit one designed to complement the original one. Symphobia 2 ships on three dual-layer DVDs and due to the way the library is streamed through Kontakt 4 (the free Player is also on the install disc if required), it will only eat 20GB of hard drive space despite running to 33GB of content. Activation comes via NI's Service Centre and thereafter you're away. So what's new? Firstly the range of articulations has expanded. The new library includes welcome 'extended' trills, crescendo patches and spicatto performances, to name but a few. For us, the most significant new addition is a set of legato ensemble patches that feature transitions to ensure that movement from one note to the next is smooth and natural. Also new is the capacity to switch from 'Close' to 'Stage' microphone positions from the GUI. This isn't the only update to the front end of Symphobia, as all available options for a loaded patch are now visible and tweakable within a single window. The richness and vastness of the material available in this library can't be explained fully in this review but take our word for it, if you're drawn to the idea of modern orchestral scoring, particularly to picture, Symphobia 2 won't let you down. Its recordings are rich and enhanced greatly by new, natural sounding articulations but its darker textures, in particular, make sound design and composition an absolute joy and very few libraries fuel inspiration right out of the box like this one. If you like the idea of atmospheres, Symphobia 2 will provide you with a palette of textures that are currently unrivalled. The high price dictates that this library will appeal to professionals only but if you work as a music-to-picture composer or are determined to bust your way in, Symphobia 2 is ready to provide your ammunition.